(Nanowerk News) For the very first time researchers have streamed braille patterns directly into a blind patient's retina, allowing him to read four-letter words accurately and quickly with an ocular neuroprosthetic device. The device, the Argus II, has been implanted in over 50 patients, many of who can now see color, movement and objects. 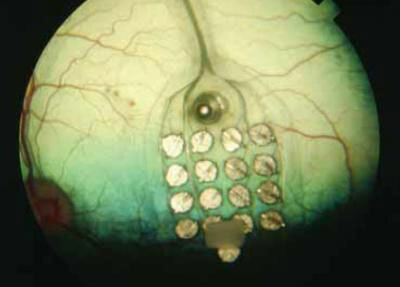 It uses a small camera mounted on a pair of glasses, a portable processor to translate the signal from the camera into electrical stimulation, and a microchip with electrodes implanted directly on the retina. The study was authored by researchers at Second Sight, the company who developed the device, and has been published in Frontiers in Neuroprosthetics ("Reading visual braille with a retinal prosthesis") on the 22nd of November.